Wednesday, 7:50am CT—It is an absolutely amazing morning in Houston—humidity is low for August, temperatures are in the low 70s, and the sun can be seen as it rises above the eastern horizon. The only trace of our recently departed Hurricane Harvey is some northwesterly winds gusting into the mid-20s. But even those should die down today. Speaking of Harvey, the storm has made its final landfall this morning, and is now located near Lake Charles, La. The storm continues to lash the Beaumont and Port Arthur area with rains (because clearly Harvey has a seething hatred for all things Texas), and they are seeing similar conditions as Houston earlier this week. Those areas should begin clearing later today too as Harvey moves steadily northeast. Let’s discuss the forecast, and also address the concerns some of you have about tropical weather next week. Skies will be partly sunny, and we expect high temperatures to rise into the upper 80s. Rain chances should be near zero. Brisk northwesterly winds will help drain bayous, too. The National Weather Service this morning urged people not to “sightsee” in damaged areas as the weather improves, and I would echo these sentiments. There are still dangers in some areas—and let’s be honest, if your home was destroyed would you want gawkers coming by to survey the damage? Heck no. Respect your fellow citizens, and the first responders taking the first steps to getting our city on the road to recovery. Something approaching summer-like weather returns to Houston, with mostly sunny skies, highs in the low 90s (but still pleasant nights in the low 70s). The air will be drier than normal summer in Houston due to the region lying on the back side of Harvey, and enjoying northerly winds through Saturday morning, at least. Honestly, this is about as fine of weather as you could hope for for late August or early September. It’s just unfortunate that we had to pay such a terribly high price for it. A bit of a transition day, as a chance of showers returns to the region (but nothing particularly heavy, we think), along with some clouds. Expect highs in the upper 80s. Ok, let’s address the big issue. The global models are showing the development of a low pressure system in the southern Gulf of Mexico by late Sunday or Monday of next week. Because the feature is in both models, we can say it may very well happen. However after this time there are pretty widely diverging solutions. The GFS model drags the feature up the Texas coast, and between Monday night and Thursday morning soaks the Houston region with about 12 inches of rainfall. However, the generally superior European model keeps the feature offshore, and drags it across the northern Gulf of Mexico toward Florida. Under this scenario, the Houston region would receive about 1 inch or rain, or perhaps less. Our advice: Do not fixate on the GFS model. This is the kind of thing that will get a lot of attention on social media, because it’s easy to share a graphic from a model run that shows Houston inundated by rainfall, especially when we’re all highly sensitized. Be smarter than that—rainfall forecasts at such long range should be considered highly suspect. 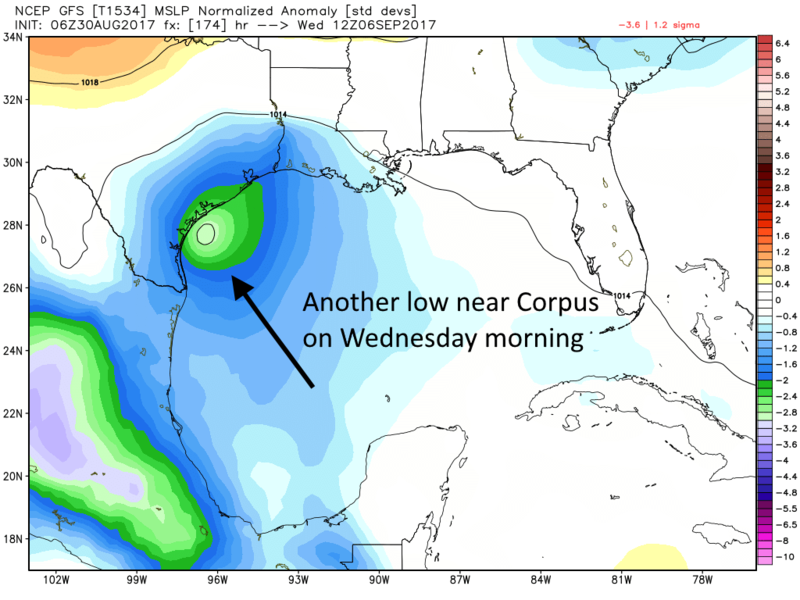 Although we always need to monitor Gulf lows in August and early September, what we can confidently say about the weather five to seven days from now is that tropical moisture may return to the area, and so we will see an increasing chance of rain beginning on Labor Day. But here’s the thing, by then nearly all of the area’s bayous will have drained to near-normal levels, and the rivers will be coming down. I am not saying things would be peachy if the region picked up another six or even 10 inches of rain, but we could handle it over a day or two. And I’m betting we don’t get nearly that much. We’ll have another post later today about a surprising meteorological record that Harvey broke that wasn’t at all rainfall-related. I can’t thank you enough for all you have done this past week. You were my lifeline during evacuation. Ditto that. These updates have been invaluable. A little rain after all of the water goes down would help clean off the streets and houses that were affected. Just a little rain. There’s going to be a lot of mud and debris left over when flood water recede. Thank you for your work, it has been so helpful this week and so much better than what you read elsewhere. Eric and Matt, I know you’ve heard it many times but hey, you get to hear it again: thank you for your posts here and on social media during this time (and before and after). I know you had even written a piece a couple of years ago regarding a worst-case scenario hurricane hitting Houston, and it felt prophetic (though I’m sure you wish you were wrong in that sense). Nevertheless, you guys handle our complex regional climate with steady, matter-of-fact writing but with some good humor sprinkled in. I know many of us have been impacted and will continue to be (fingers crossed that the Brazos doesn’t creep too much further) but I also hope you and Matt are ok. Somewhat forgotten in this is that on top of providing near-constant updates, you both live here and have families going through it like the rest of us; you shared those worries and anxieties that we all had but still kept watching the changing models and forecasts and providing the updates many of us were looking for. So a massive, massive thanks to both of you and your families, and you both deserve a bust (even if it’s just paper mache). 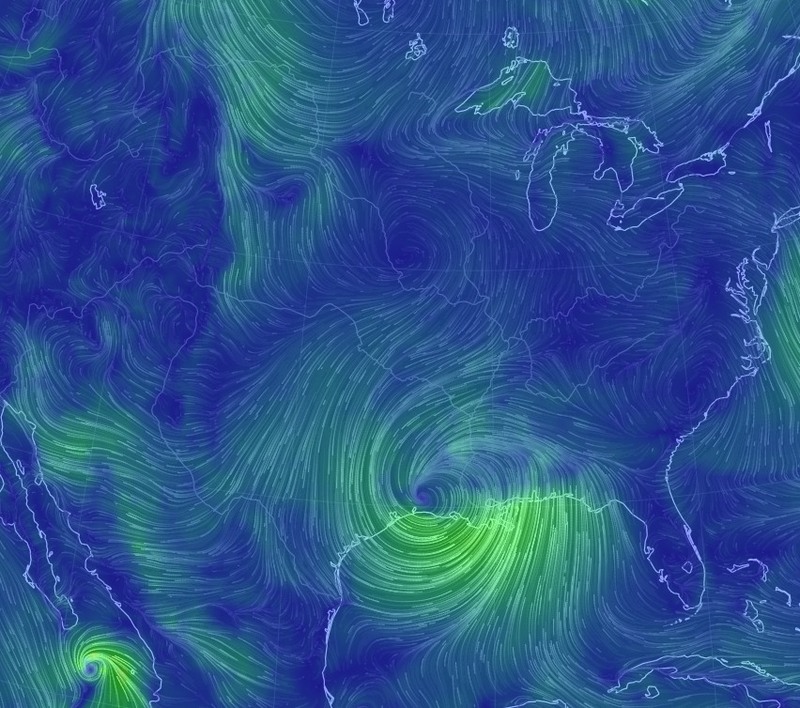 What a beautiful graphic for such a horrible storm. It does help keep perspective. Thank you again for such level reporting and what that adds in dealing with this storm. Thinking is also a force of nature! Thank you Eric and Matt!! As always, we were able to count on you! We really appreciate your effort with this blog and providing such great ongoing information. It was our lifeline, too. Thank you! Y’all are such a refreshing voice of reason. Thanks for everything. I really appreciate what you do. I live in Atlanta, but have grown children in League City and Dickinson, and you’ve been my main source of weather information these last few days. Thank you! Your hype free weather updates were my calm…thank you! This is my first time to follow y’all and it was a tremendous help. Thank you for your knowledge and levelheadedness approach of sharing. Yes, once again THANK YOU!!! We were stuck on the second floor of a League City house since Sunday morning. All the major networks focused on water rescues and drama (not unimportant, but for us…not what we needed). You came thru with the best, up to date, forecasts so we could prep for what was coming. We made it through too. So, cheers to the Space City Weather team! Thank you so much for all you did this week. I, for one, really do appreciate your effort in keeping us informed. Your coverage of this weather event has been incredible. Y’all are simply amazing, thank you so much! Thank you for all the honest forecasts. Last four days reading your posts has become a ritual for me. Nothing can be more assuring than an honest assessment of what’s in store. Thanks again and keep up the great work you do. I want to commend you on your excellent reporting. I’m in New Mexico, and it was harrowing to witness this from afar, knowing you can’t help your Family, trapped in Kingwood. Your concise reports were all I had. When my daughter and her children 6, 3 and 2 years old, lost power, generator and all communication, you stayed steady through the days and nights like a beacon. I’m so grateful. Thank you with all my heart. You guys are awesome! My guess on the surprising meteorological record is an all-time low temperature (min or max) for August at IAH or one of the area NWS stations. I wish I had an archive of the old SciGuy blogs. I so distinctly remember around Aug/Sept 2011, when we were in that devastating drought. Eric’s post was “Yes, it will rain again. This is the Gulf Coast. We don’t know when but we will get rain.” I still remember the comfort of those words. Omg, thank you, thank you, thank you for being the voice of reason in the weather world! Your posts did so much to help with anxiety over the last few days. 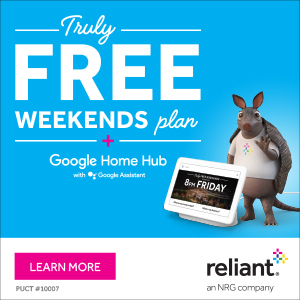 I let Reliant know that they’re backing two good guys. Thank you for your updates. I’m a fan for life. Thank you! Great reporting all week. That’s for an awesome job. Can you offer any guidance as to when evacuees can return? We are trying to determine whether/when 290 and I-10 will reopen. Local news in the Austin area doesn’t provide info about road conditions or whether grocery stores, gas stations and the like are opening. We don’t think our house flooded and want to come home as soon as it’s safe. 290 looks open to me. I love you! I love Matt! I love Space City Weather! I love sunshine! I LOVE Houston!!! Can’t thank you enough for your thorough and thoughtful updates. For all of us in the region – and also for friends and family elsewhere who are trying to read between the hype on the major news outlets. Your work is a huge help, thank you so much! Thank you so much. I am in Indiana and have a family in Houston. I so appreciate your up to date weather. I rely on it. A million and more thanks to you and Matt. Thank you for this, too! Hi, I cant seem to find any coverage about the pollution that is/was being released? I live in East Houston and have noticed the air smelling like chemicals. Is there anyone reporting on this? Have seen some good coverage in the Washington Post. You guys rock!! I’ve relied on your voice of reason for years and you didn’t disappoint again. Thank you, thank you!! Thank you for everything you both do. This website is an invaluable resource. Thank you for all the excellent forecasts this week. From a mother who lives in Pittsburgh.Pa who has a daughter that lives in The Heights it was great to know exactly what was going on instead of the national look of it’s a lot of rain. Hope you are all okay. “I survived Harvey with Space City Weather” or something along those lines. Y’all were the calming voice as I waited it out in Clear Lake. I’m still stunned by what I saw and that water actually came into my home, which sits higher than most. Definitely a learning experience. Thank you, Thank you, Thank you! You guys have gone above and beyond this week and I am very grateful for your posts. You are the calm in the storm and I have total confidence in your forecasts. Thanks to your families too. Keep it up; I’m a fan for life. So what’s with TS Irma? Coming this direction? TS Irma is headed along the east coast, nowhere near us. Thank you for your perseverance and commitment to credible, scientific meteorological analysis and commentary. You’re a tremendous asset to the community. Thank you both for your analysis and comments during this time. Having a source that does not sugar coat nor sensationalize the weather is vital to this city. You both deserve recognition for your efforts. I thank you for your excellent coverage which has allowed me to remain sane the last few days. Where can I get the most accurate and up-to-date information regarding Addicks and Barker Dam releases? They affect my house and my parents’. Also would like updated info on Buffalo Bayou levels. It us clear that the flood control system we have relied on since the mid-1930s has failed us. It is also clear that without real reform in our infrastructure mgmt system we are in deeper trouble. So will we rise to the occasion? Thank you, Eric and Matt for your continued updates throughout this storm. I was able to keep my family in the Midwest at ease with your no-hype news. I will continue to use your site as I monitor for weather from now on. Your efforts are truly appreciated. This site has been the absolute best site during this horrific event. Thanks so much!!! Thank you for all you have done for me, my family, and our city. You are unsung heroes in all of this and we are grateful for your unwavering, selflessness throughout the past week. I appreciate your no nonense reporting during this high intensity time for our city. Your dry wit brought some levity to our on going weather drama during the last several days. Most of all, you know our city, our state and our people and you know what we need to hear. I will stick with you in the days to come as we begin to recover. I must observe as a non-Houstonian (Oxford, Mississippi) that I have never seen anything anywhere like Space City Weather. What a service you provide – – so smartly, humanely, and thoughtfully. I see in so many of the comments how much you mean to your fellow citizens, and the reason for that is so abundantly clear. First of all, Eric, I’m glad I’ve found you again after you left the Chronicle. Keep up the level-headed work.